Reactive oxygen species (ROS) such as superoxide anions, hydrogen peroxide, and hydroxyl, nitric oxide radicals, play an important role in oxidative stress related to the pathogenesis of various important diseases. Active (or reactive) oxygen species and free radical-mediated reactions are involved in degenerative or pathological processes. Antioxidants act as a major defense against radical mediated toxicity by protecting against the damages caused by free radicals. Antioxidant-based drugs/formulations for the prevention and treatment of complex diseases like atherosclerosis, stroke, diabetes, Alzheimer's disease, and cancer have appeared during the last three decades. This has attracted a great deal of research interest in natural antioxidants. Flavonoids and phenolic compounds widely distributed in plants which have been reported to exert multiple biological effect, including antioxidant, free radical scavenging abilities, anti-inflammatory and anticarcinogenic activities. Recently there has been an upsurge of interest in the therapeutic potentials of medicinal plants as antioxidants in reducing such free radical induced tissue injury. The aim of the present investigation was to evaluate in vitro antioxidant and free radicals scavenging effect of two edible weeds. Certain weeds are nutritious and eaten as foods or vegetables. In the present study two weeds namely Chenopodium album and Vitis trifolia have been screened for their antioxidant potential by using various in vitro methods. Aqueous leaf extract Chenopodium album and methanolic fruit extract of Vitis trifolia exhibit significant reducing power and free radical scavenging effect on DPPH, hydroxyl, superoxide, hydrogen peroxide radicals. The extracts also inhibit nitric oxide production. All these antioxidant activities were concentration dependent which were compared with standard antioxidants such as BHA, á-tocopherol and ascorbic acid. In addition, total phenolic and total flavonoids contents were determined as gallic acid and catechin equivalents respectively. From the results, C. album leaf extract was found to contain 0.94 % total phenolic contents (gallic acid equivalent) and 0.27 % total flavonoid contents (catechin equivalent). Whereas V. trifolia fruit extract was found to contain 1.23 % phenolic compounds as gallic acid equivalent (GAE) and 0.38 % flavonoid content as catechin equivalent (CE). Free radicals such as superoxide anions, hydrogen peroxide and hydroxyl nitric oxide radicals, cause degenerative human diseases such as cancer, heart disease and cerebrovascular disease through multiple mechanisms  . Antioxidant components delay or inhibit lipid oxidation, by inhibiting the initiation or propagation of oxidizing chain reactions, and are also involved in scavenging free radicals. In recent years, research in this area has focused on the detection of antioxidants in food, because there is evidence that they could play an important role in the prevention of several illnesses as well as in the retardation of the aging process  . Fruits and vegetables are reported to contain a wide variety of antioxidant components including phenolic compounds , . Chenopodium album and Vitis trifolia are nutritious and edible wild weeds found in India , . Chenopodium album Linn. (Chenopodiaceae) is traditionally used as anthelmintic, cardiotonic, carminative, digestive, diuretic, laxative and also useful in peptic ulcer, dyspepsia, flatulence, strangury, pharyngopathy, splenopathy, opthalmopathy and general debility. A fine powder of leaves is dusted to ally irritation and leaf juice is used for treating burns. The powered plant (25-50%), when mixed with normal food was reported to suppress oestrus cycle. A decoction of aerial parts mixed with alcohol is rubbed on the body affected by arthritis and rheumatism , . Vitis trifolia Linn. (Vitaceae) is commonly known as Ramchana in India. The plant has astringent, antiscorbutic, antitumor and rubefacient properties , . The aim of the present investigation was to evaluate in vitro antioxidant and free radical scavenging potential of Chenopodium album (CA) and Vitis trifolia (VT). Chemicals used in this study were 2, 2-diphenyl-1-picrylhydrazyl (DPPH), potassium ferricyanide, sodium nitrite, trichloroacetic acid, Folin-Ciocalteu reagent, sodium nitroprusside, sulfanilamide, N-1-naphthylethylenediamine dihydrochloride, butylated hydroxy anisole (BHA), ascorbic acid, á-tocopheryl acetate, ethylenediamine tetra-acetic acid, phosphoric acid, naphthylethylenediamine dihydrochloride, nitro blue tetrazolium, NADH, phenazine methosulfate , ferrous ammonium sulfate, DMSO and hydrogen peroxide. All reagents used for the study were of analytical grade. Both plants were collected from surrounding areas near Kurukshetra University, Kurukshetra, Haryana, India during October-November 2006 and authentified from the Department of Botany, Kurukshetra University, Kurukshetra, Haryana, India. The fruits of Vitis trifolia were cleaned, dried in the shade, then powdered to 40 mesh and stored in an airtight container at 25 o C. The leaves of Chenopodium album were cleaned and used for maceration. Vitis trifolia fruits (100 g) in powdered form were extracted with methanol by Soxhlet assembly for 48 h. The extract was filtered and dried on a water bath. The last traces of the solvent were evaporated under reduced pressure in a rotary evaporator. The yield of fruit extract was 7.87 g. The aqueous extract of Chenopodium album leaves (200 g) was prepared by decoction method and dried under vacuum. The yield of leaf extract was 2.93 g.
The total phenolic contents of both extracts were determined spectrometrically  . One milliliter of Folin-Ciocalteu′s reagent, previously diluted (1:20), was added to one milliliter of sample (250 µg/ml) and mixed thoroughly. To the mixture, 4 ml of sodium carbonate (75 g/L) and 10 ml of distilled water were added and thoroughly mixed. The mixture was allowed to stand for 2 h at room temperature. Contents were then centrifuged at 2000 g for 5 min and the absorbance of the supernatant was taken at 760 nm. A standard curve was obtained using various concentrations of gallic acid. Results were expressed as percentage of gallic acid equivalents (GAE) per 100 g of fresh mass. Total flavonoid content was measured by aluminum chloride colorimetric assay  . One milliliter of extract or standard solution of catechin (500 µg/ml) was added to 10 ml volumetric flask containing 4 ml of distilled water. To the above mixture, 0.3 ml of 5% NaNO 2 was added. After 5 minutes, 0.3 ml of 10% AlCl 3 was added. At the 6 th minute, 2 ml of 1 M NaOH was added and total volume was made up to 10 ml with distilled water. The solution was mixed well and the absorbance was measured against prepared reagent blank at 510 nm. Total flavonoid content of the fruit was expressed as percentage of catechin equivalent per 100 g of fresh mass. The extracts with different concentrations were placed in test tubes and evaporated to dryness. One ml of iron-EDTA solution (0.13% ferrous ammonium sulfate and 0.26% EDTA), 0.5 ml of 0.018% EDTA, 1 ml of DMSO (0.85% v/v in 0.1 M phosphate buffer, pH 7.4) and 0.5 ml of 0.22% ascorbic acid were added to each tube. The tubes were capped tightly and heated in a water bath at 80-90 o C for 15 min. The reaction was terminated by adding 1 ml of ice-cold TCA (17.5% w/v). Three ml of Nash reagent (75.0 g of ammonium acetate, 3 ml of glacial acetic acid and 2 ml of acetyl acetone were mixed and distilled water was added to make up total volume of 1 L) were added to each tube, which were left at room temperature for 15 min for colour development. The intensity of the yellow colour formed was measured at 412 nm against blank of the reagent. The percentage inhibition was determined by comparing the results of the test and standard compounds  . where A 0 was the absorbance of the control, and A 1 was the absorbance in the presence of the sample and standards. where A 0 was the absorbance of the control and A 1 was the absorbance of extract or standard compounds. Nitric oxide scavenging activity was measured spectrophotometrically  . Sodium nitroprusside (5 mM) in phosphate buffered saline was mixed with different concentrations of the extract ((250, 500, 1000, 1500, 2000 and 2500 mg/ml)) prepared in methanol and incubated at 25°C for 30 min. A control without the test compound but with an equivalent amount of methanol was used. After 30 min, 1.5 ml of the incubated solution was removed and diluted with 1.5 ml of Griess reagent (1% sulphanilamide, 2% phosphoric acid and 0.1% N-1-naphthylethylenediamine dihydrochloride). The absorbance of the chromophore formed during diazotization of the nitrite with sulphanilamide and subsequent coupling with N-1-naphthylethylene diamine dihydrochloride was measured at 546 nm and percentage scavenging activity was measured with reference to standard. The reducing power of extracts was determined as per the reported method  . Different concentrations of fruit extract (250, 500, 1000, 1500, 2000 and 2500 mg/ml) in 1 ml of methanol were mixed with phosphate buffer (2.5 ml, 0.2 M, pH 6.6) and potassium ferrocyanide (2.5 ml, 1%). The mixture was incubated at 50 o C for 20 min. A portion (2.5 ml) of trichloroacetic acid (10%) was added to the mixture, which was then centrifuged at 3000 rpm for 10 min. The upper layer of the solution (2.5 ml) was mixed with distilled water (2.5 ml) and FeCl 3 (0.5 ml, 0.1%). The absorbance was measured at 700 nm and compared with standards. Increased absorbance of the reaction mixture indicated increased reducing power. The free radical scavenging activity was evaluated by various in vitro assays. DPPH radical was used as a substrate to evaluate free radical scavenging activities of extracts. 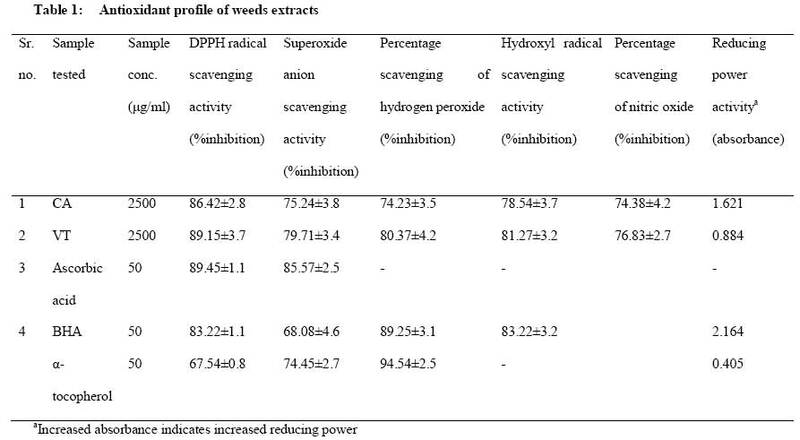 The scavenging effect of CA aqueous extract on the DPPH radical was 86.42%, at a concentration of 2500 ìg/ml whereas scavenging effect of VT methanolic extract was 89.15%. 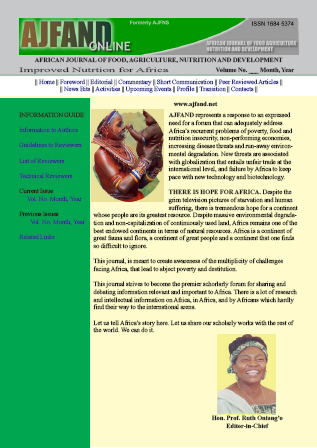 These results indicated that extracts have significant effect on scavenging the free radicals. 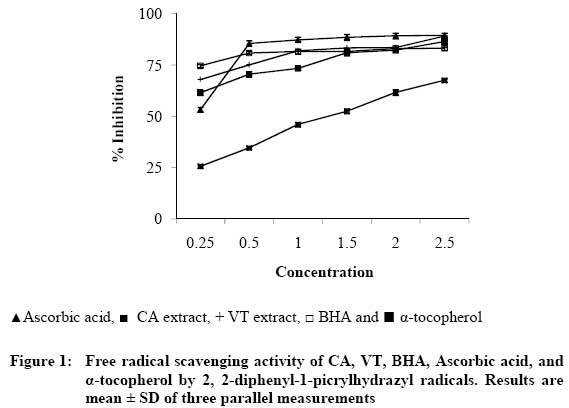 [Figure - 1] illustrates a significant decrease in the concentration of DPPH radical due to the scavenging ability of C. album leaf extract and V . trifolia fruit extract. BHA, ascorbic acid and á-tocopherol were taken as standards. 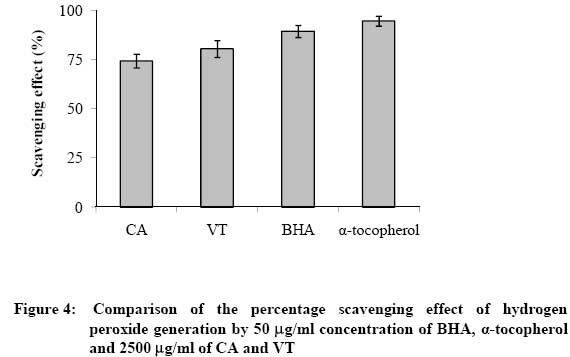 (Concentrations of CA and VT are expressed in mg/ml whereas concentrations of BHA, Ascorbic acid and á-tocopherol are expressed in 20 x mg/ml). The superoxide anion radical scavenging activities of extracts were assayed by the PMS-NADH system. 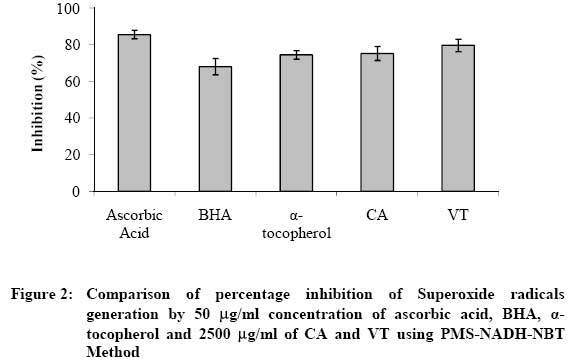 [Figure - 2] shows the percentage inhibition of superoxide radical generation by extracts and comparison with ascorbic acid, BHA and á-tocopherol. The percentage inhibition of superoxide generation by 2500 µg/ml concentration of CA and VT was found as 75.24 and 79.71% respectively. On the other hand, ascorbic acid, BHA and á-tocopherol at concentration of 50 µg/ml have 85.57%, 68.08% and 74.45% inhibition of superoxide radical. H 2 O 2 is very important because of its ability to penetrate biological membranes. H 2 O 2 itself is not very reactive, but it can sometimes be toxic to cell because it may give rise to hydroxyl radical in the cells. Thus, removal of H 2 O 2 is very important for protection of food systems. [Figure - 3] shows the H 2 O 2 scavenging activity by CA and VT at concentration of 2500 m/ml. This is compared with 50 m/ml of BHA and á-tocopherol. The percentage of H 2 O 2 scavenging activity of CA, VT, BHA and á-tocopherol was found as 74.23 , 80.37, 89.25 and 94.54%, respectively. (Concentrations of CA and VT are expressed in mg/ml whereas Concentration of BHA is expressed in 20 x mg/ml). Hydroxyl radicals are the major active oxygen species causing lipid oxidation and enormous biological damage  . 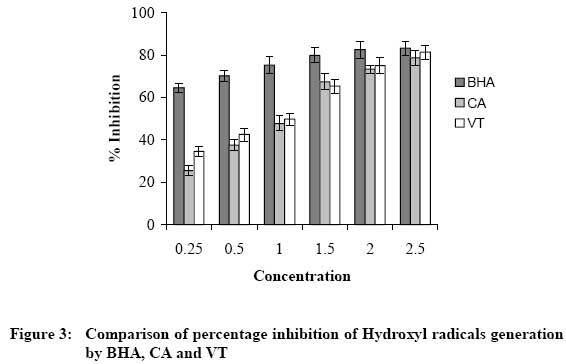 The percentage of hydroxyl radical scavenging was significantly increased with the increasing concentrations of extracts [Figure - 4]. The antioxidant activity of extracts and standard compounds was compared by using specific in vitro methods. Nitric oxide (NO) is a potent pleiotropic mediator of physiological processes such as smooth muscle relaxation, neuronal signaling, inhibition of platelet aggregation and regulation of cell mediated toxicity. It is a diffusible free radical which plays many roles as an effector molecule in diverse biological systems including neuronal messenger, vasodilation and antimicrobial and antitumor activities  . 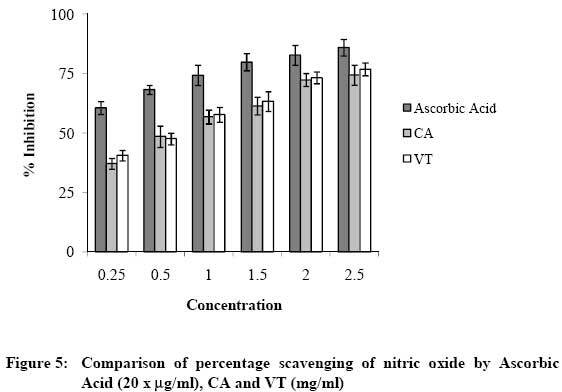 [Figure - 5] illustrates the percentage inhibition of nitric oxide generation by CA and VT. Ascorbic acid was used as a reference compound. For the measurements of the reducing ability, ′′Fe 3+ - Fe 2+ transformation′′ in the presence of CA and VT was found. The reducing capacity of a compound may serve as a significant indicator of its potential antioxidant activity. The reductive capabilities of extracts were compared with á-tocopherol. The reducing powers of CA and VT were found to increase with increasing concentrations [Figure - 6]. 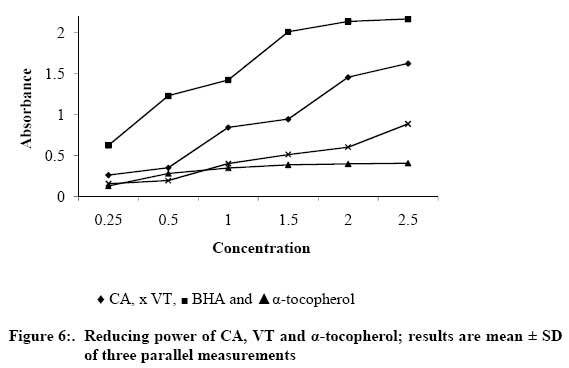 (Concentrations of CA and VT are expressed in mg/ml whereas concentration á-tocopherol is expressed in 20 x mg/ml). Oxidative stress, the consequence of an imbalance of prooxidants and antioxidants in the organism, is gaining recognition as a key phenomenon in chronic illness like inflammatory and heart diseases, hypertension, and some forms of cancer  . Plant-based, antioxidant- rich foods traditionally formed the major part of the human diet, and plant-based dietary antioxidants are hypothesized to have an important role in maintaining human health  . In this report, we investigated the crude extracts of these plants for their potential antioxidant activity. The free radical scavenging activity of the extracts was evaluated based on the ability to scavenge the synthetic DPPH. This assay provided useful information on the reactivity of the compounds with stable free radicals, because of the odd number of electrons. Superoxide radical is a highly toxic species, which is generated by numerous biological and photochemical reactions  . In the PMS-NADH-NBT system, superoxide anion, derived from dissolved oxygen from the coupling reaction of PMS-NADH, reduces NBT. The decrease in absorbance at 560 nm with antioxidants indicates the consumption of superoxide anion in the reaction mixture. [Figure - 2] shows the percent inhibition of superoxide generation by extracts. The activity of VT and CA against superoxide radical is of significance because superoxide can decrease the activity of other antioxidant defense enzymes such as catalase and glutathione peroxidase as well as being cytotoxic by generating more reactive species like peroxy nitrite  . Superoxide radicals are more detrimental due to their role as second messengers in fibroblast proliferation in inflammation and mediators of tissue destruction  . The extracts VT and CA showed significant superoxide radical scavenging activity. Sodium nitroprusside serves as a chief source of free radicals. The absorbance of the chromophore formed during diazotization of the nitrite with sulphanilamide and subsequent coupling with napthylethylene diamine is used as the marker for NO scavenging activity  . The chromophore formation was not complete in the presence of VT and CA, which scavenge the NO thus formed from the sodium nitroprusside and hence the absorbance decreases as the concentration of the extracts increases in a dose dependent manner. The extracts have also shown reducing capacity. Studies have indicated that the antioxidant effect is related to development of reductones. Reductones are reported to be terminators of free-radical chain reactions  ; thus the antioxidant activity of both plants may be also related to its reductive activity. Both plants also showed significant hydrogen peroxide and hydroxyl radicals scavenging effect. These radicals are also highly toxic. The antioxidant activity of extracts and standard compounds were compared by using specific in vitro methods [Table - 1]. From the results, C. album leaf extract was found to contain 0.94 % total phenolic contents as GAE and 0.27 % total flavonoid contents as CE, whereas V. trifolia fruit extract was found to contain 1.23 % phenolic compounds as GAE and 0.38 % flavonoid content as CE. It has been reported that the antioxidative effect is mainly due to phenolic components, such as flavonoids  , phenolic acids, and phenolic diterpenes  . So, antioxidant activities of Vitis trifolia and Chenopodium album may be due to presence of phenolic and flavonoid contents. On the basis of the results of this study, it is concluded that both the extracts have significant antioxidant activity compared to other well characterized, standard antioxidant systems in vitro . In addition, the antioxidant activity may be due to phenolic compounds in both plants. However, the components responsible for the antioxidative activity of CA and VT are currently unclear. Therefore, it is suggested that further work be performed on the isolation and identification of the antioxidant components of C. album and V. trifolia .